By Angela Roskop Erisman, Ph.D.
Angela Roskop Erisman is Managing Director of Hebrew Union College Press and Editorial Director at the Marginalia Review of Books. She has taught Hebrew language and Bible courses at HUC-JIR and Xavier University and served as a freelance editor/writing coach in all areas of Jewish Studies. Her scholarly interests include Torah, ancient historiography, literary theory, archaeology, and biblical law, and she is author of The Wilderness Itineraries: Genre, Geography, and the Growth of Torah. When not studying Torah or polishing prose, she cooks, does calligraphy, and plays the violin. I lack my mother’s talent at crafty things. My childhood cross-stitches were uneven. Crocheting made my fingers hurt. And knitting? A non-starter. But I do enjoy the results of her work, and my favorite is a pinwheel quilt she made for me many years ago—out of book fabric. It’s big. I love to disappear beneath its folds on a cold afternoon with a good book. The quilt is not the only thing I get lost in. As a scholar and a publisher, books are a big part of my life. I read them. I write them. I edit them. You’d think it would be a great joy to sit around and read all day. On one level, it is. I’m really very, very lucky. On the other hand, when you read a lot of the same kinds of books on the same subjects, as I’m often required to do, it can feel more like drudgery. You might keep reading words, but your brain checks out. One of the reasons I love books is that they keep my brain from getting too narrow and mushy. Books give us access to ideas that challenge us. Well-written books also call on us think about how words work and the creative, fun, and beautiful things one can do with them. When I’m feeling the drudgery, I try to mix it up a little and read a poem or a short story or an article about something completely different. My brain becomes sharper and more expansive. I can look at my work and the world around me with more observant eyes, able to notice and embrace things I might otherwise have missed. Another reason I love books is that they make me a better human being. I read quite a lot about how we read and what it does to us when we do. One person who has really influenced me is Martha Nussbaum. Her books are (necessarily) complicated, but her main point is simple. Books, especially fictional books, invite us to enter into experiences we may never otherwise have. They teach us to navigate the moral complexities of life as we empathize with characters, see how their predicaments work out (or fail to), and think critically about what we’ve read. As a result, books cultivate in us important human qualities like love and justice. Who says you can’t learn anything practical from fiction… And, in a for-the-Bible-tells-me-so world where it seems like the only options are blind adherence or bust, Nussbaum’s ideas put a whole new spin on what a relationship with that old book might look like. I love books—or, more to the point, libraries—for social and political reasons, too. In a wonderfully thought-provoking article in The New York Review of Books, well worth reading in its entirety, novelist Zadie Smith writes, “A library is a different kind of social reality (of the three dimensional kind), which by its very existence teaches a system of values beyond the fiscal… [The library is] the only thing left on the high street that doesn’t want either your soul or your wallet.” It doesn’t matter how old you are, how much money you have, how well-dressed you are. Anyone off the street can walk into a library, find a quiet, private space in the midst of this public space, and browse the best ideas and the most delightful stories in human history for as long as they like. Or at least until closing time, although I know stories of people-who-shall-remain-nameless who have managed to thwart authorities and remain in the library all night. Not that I’m encouraging that kind of behavior. Circulation desks exist for a reason. Books are also a powerful way to connect with tradition. I have long loved a saying attributed to the Jesuit priest Pedro Arrupe, which contains the line, “What you are in love with, what seizes your imagination, will affect everything.” Like many people, my relationship with religion is complicated. I loved and studied Jewish literature for over a decade before it ceased to be merely an intellectual interest and became a personal one. By that time, conversion was not practical. But every time I open my Bible, read a commentary, or write one, I enter into conversation with the Jewish stream of tradition and find my own place within it. Books are certainly not the only shapers of culture and identity. Come to my house next December for latkes and house-cured salmon, and you’ll see. But I love books not only because they shape my capacity for love and justice and help me understand the complexity of human nature, but also because help me know who I am. And you can digest them as many times as you like. It may be about as tough to define a Jewish book as it is to define a Jew. I like to think that every book that makes you think, that evokes your creativity, that opens you to new possibilities in life, is in some sense a Jewish book. Some ancient Jews embraced literature that was written outside of the Jewish tradition. Ben Sira, for example, recognized wisdom to be gained from Greek books alongside Jewish at a time when it was controversial to look outside the Jewish tradition for worthwhile ideas. I prefer the more expansive view, perhaps because study is such a core value within Judaism. Whenever I study, whatever I study, it seems to me to fulfill the obligation of Torah study. My husband, an amateur musician like myself, reminds me to “practice every day.” I try to apply the same mantra to reading. My life is as busy as that of the next American. I have two jobs, a family to care for, and two books I’m trying to research and write somewhere other than in my head. When it’s hard to find time, I remind myself that reading can be a Shabbat-like respite in my day. Abraham Joshua Heschel describes Shabbat rest as a productive kind of rest that refreshes you and reorients your compass to what’s important after the distracting “thinginess” of a busy week, so that it might guide you into the next. Books do that for me. They ask of me a level of focus, attention, openness, and empathy that spills beyond my reading time to enrich the rest of my life. That is ultimately why I love books, and why life is better with time spent warm beneath my quilt. 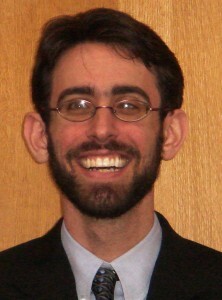 Jack Romberg has been Rabbi of Temple Israel in Tallahassee since August 2001. He is quite active in local and state political affairs. He has been on the editorial board of the Tallahassee Democrat and still contributes columns to the paper. He is a co-founder of Tallahassee Interfaith Clergy and currently a member of “The God Squad,” a panel of Tallahassee clergy addressing faith and political issues under the umbrella of “The Village Square.” This blog post is cross-posted, with Rabbi Romberg’s permission, from his blog. 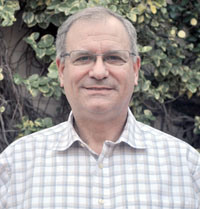 Rabbi Geoffrey A. Mitelman is the Founding Director of Sinai and Synapses, an organization the seeks to bridge the scientific and religious worlds, which is being incubated at Clal. He was ordained by the Hebrew Union College-Jewish Institute of Religion and is an alumnus of Princeton University. His writings about the intersection of religion and science have appeared on the homepages of several sites, including The Huffington Post, Science and Religion Today, Jewish Telegraphic Agency, My Jewish Learning and WordPress.com. I am thankful for the mess to clean after a party, because it means that I have been surrounded by friends. I am thankful for the clothes that fit a little too snug, because it means I have enough to eat. I am thankful for a lawn that needs mowing, windows that need cleaning, and gutters that need fixing, because it means I have a home. I am thankful for the parking spot I find at the far end of the parking lot, because it means I am capable of walking. I am thankful for my huge heating bill, because it means I am warm. I am thankful for the piles of laundry and ironing, because it means I have clothes to wear. And I am thankful for the alarm that goes off in the early morning hour, because it means that I have another day in front of me. If we really know how to look for them, we can find an awful lot of things to be thankful for – even those things that may drive us nuts at the time. Perhaps that is why the Talmud (Menahot 43b) commands us to say one hundred blessings, one hundred things to be thankful for, every day. Now, that may sound like a lot of blessings to say, but if the assignment was, “come up with one hundred things to complain about every day,” my guess is that we could all do that in about three and a half minutes. The truth is, how we view the world affects how we act in the world. We certainly have one hundred things that we do every day – make phone calls, hold meetings, eat meals. The question is, through what lens do we look at those events? And if we try to find one hundred blessings every day, we begin to experience our world as a world that is renewed with blessings each and every day. This is not to say that every moment in life is easy or that everything we experience is positive. Rather, it comes down to the question of our disposition. Robert Emmons, a professor at UC Davis and author of the book Thanks! How the New Science of Gratitude Can Make You Happier poses a simple question — when you think about a time that you felt grateful, what other feelings do you associate with this state? As Emmons notes, “Most people think of words like ‘peaceful,’ ‘content,’ ‘warm,’ ‘giving,’ ‘friendly’ and ‘joyful.’ You’d be unlikely to say that gratitude makes you feel ‘burdened,’ ‘stressed,’ or ‘resentful.’” (25) Clearly, “feeling grateful” correlates with a lot of other positive emotions. But Emmons wondered what exact consequence an “attitude of gratitude” actually had. So he designed an experiment. He randomly assigned people into three groups, the “blessings” group, the “hassles” group and the control group. Every day for three weeks, the people in the “blessings” group were to write down five things they were thankful for. Not even a hundred – just five. On contrast, every day for three weeks, the people in the “hassles” group were to write down five things that annoyed them. The control group just listed “things that had happened,” without accentuating the positive or the negative. At the beginning and end of the study, each person rated not only their level of happiness and satisfaction in life, but also factors related to their mental and even physical well-being. As you’d expect, after the three weeks, the people in the “blessings” group felt better about their lives in general. The surprise was just how much better. In other words, the people who focused on their blessings weren’t just “giving thanks for their health” – by giving thanks, they actually improved their health! Simply because they were looking for the blessings in their lives, because they were actively trying to find things to be grateful for, they ended up creating their own blessings. And what was even more striking was those who felt like they were blessed were significantly more likely to have helped someone else with a personal problem or offered emotional support. So the blessings they found in their own lives they were then transformed and used to help others. One hundred blessings every day, Judaism says. Traditionally, each day when we wake up, we say the nisim b’chol yom, the blessings of the every day. “Thank You, God, for restoring my soul to me. Thank You for giving me another day of life. Thank You for eyes to see, for legs to walk, for clothes to wear.” Judaism is very much about seeing the holiness in this world in order to bring more holiness into this world. So in the end, our greatest Jewish responsibility is to give thanks, because when we give thanks, we recognize the holy potential of our world and bring more of it into people’s lives. And with that potential, when we look – when we really look – for one hundred blessings every day, we can then create even more of those blessings, for ourselves and for our world. On this Thanksgiving weekend, then, may we have eyes that are open to the blessings that are always with us, and may we always remember just how much can happen from the simple power of giving thanks. 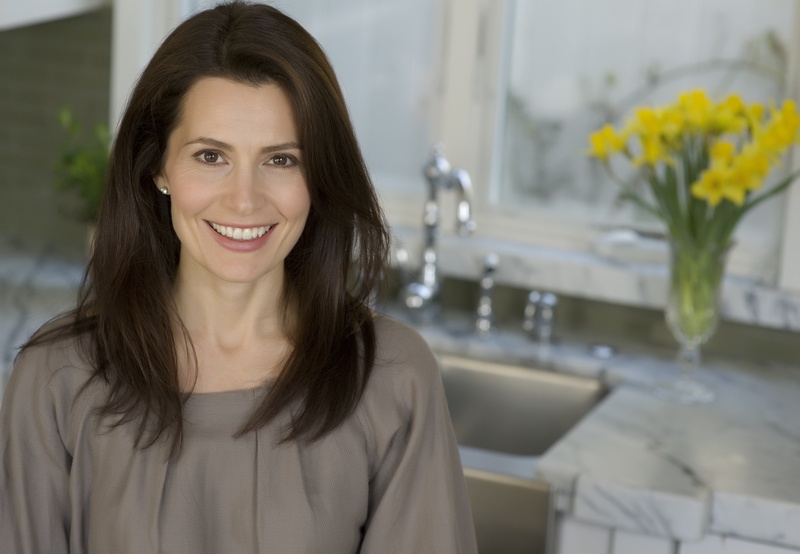 Pamela Salzman is a natural foods cooking instructor and holistic health counselor. She offers recipes, nutrition advice and cooking tips on her blog. 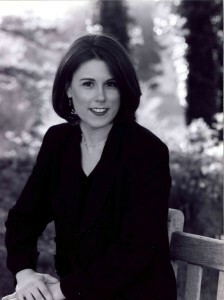 Pamela lives in Manhattan Beach, California with her husband and three children. You can follow her on Facebook here. After this year, none of us will ever again experience the first day of Hanukkah falling on Thanksgiving day. So it’s only fitting that we mark the occasion and enjoy a unique, festive holiday meal. 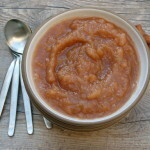 As I thought about how to blend the two holidays into one fantastic menu this year, I realized how complementary all the traditional Jewish holiday foods are with traditional Thanksgiving holiday foods! This will not only be fun, but not as hard as I originally thought. 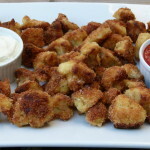 If you’re looking for a good hors d’oeuvre or side dish, my family is crazy for these fried cauliflower, which help tie in the Hanukkah tradition of foods cooked in oil. Just omit the Parmesan if you’re serving turkey (and you keep kosher). 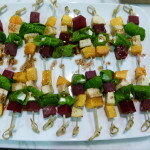 Another beautiful and healthful starter are these butternut squash, apple and beet skewers. I love that I can do all the prep for this recipe the day before! 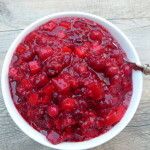 Latkes are a must, so if I make traditional potato pancakes, I think I’ll serve them with my favorite cranberry-apple relish instead of just the typical applesauce, although I do have a fabulous slow cooker applesauce recipe that will free up your oven and stovetop. Of course, it would be fun to mix it up with a different latke recipe this year. My kids actually love these zucchini latkes. And I think this apple latke recipe from Smitten Kitchen looks great. Thanksgiving is not the same without stuffing, but I am going to swap cubes of toasted challah for the bread in this recipe. I always make several pies on Thanksgiving, including apple, pumpkin, and pecan, but I’m going to surprise my family this year with Pumpkin Fritters from the new AOC cookbook. Chef Suzanne Goin describes these as “pumpkin-pie doughnuts.” Perfect!